Former state superintendent Tony Bennett lost his re-election bid in 2012. UPDATED 2:15 p.m. EST — The Indiana Inspector General has filed an ethics complaint against former state superintendent Tony Bennett for using state computers for campaign business during his 2012 reelection bid. 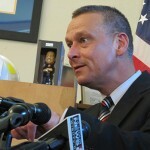 This summer, the Associated Press published documents showing Bennett’s team kept a database of Republican donors on Indiana Department of Education computers. Bennett, a Republican, served one term as state superintendent before being ousted by current schools chief Glenda Ritz. He resigned his post as Florida Commissioner of Education earlier this year after media reports revealed his team changed the school letter grades of several schools here in Indiana, including a charter founded by a prominent campaign donor. Indiana Inspector General David Thomas declined to comment on the complaint. A hearing has been set for Jan. 9, 2014. Read a copy of the complaint here.